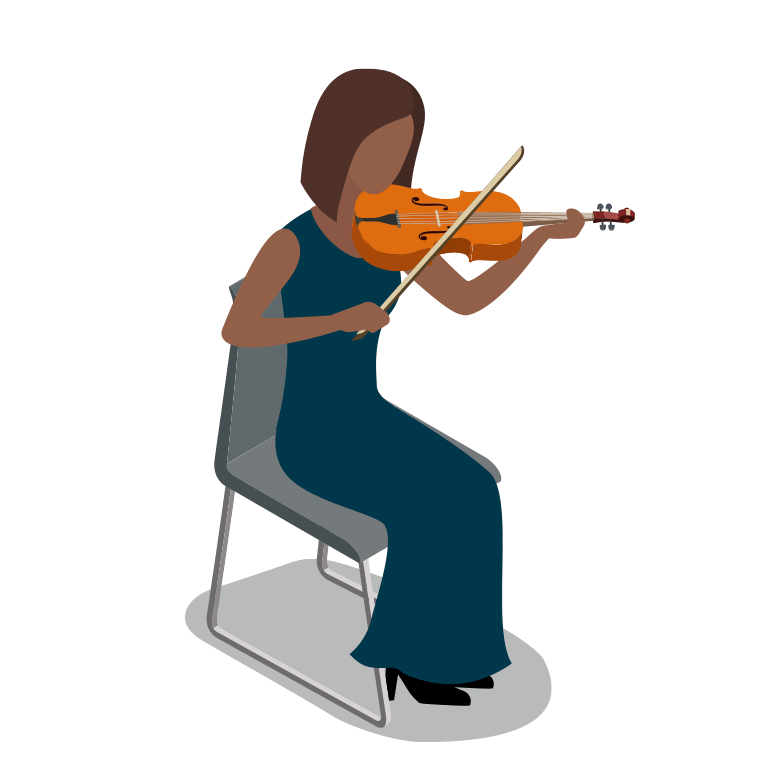 Question: have you ever thought about how much maintaining an instrument will cost an orchestra string musician during his/her career? I’m not a string expert. I can’t differentiate between a Stradivari and a ‘del Gesù’ after listening to only a few notes. But after nearly two decades of working with orchestral string musicians and their employers, and being married to a concertmaster, I’m confident that I know far more about the dollars and cents they put into their instruments than they do. And I can say with the utmost assurance that they spend a great deal more to equip, maintain and repair their instruments than most of them realize. Nevertheless, it is extremely useful for players to calculate how much they spend on supplies such as strings and bow rehairs, along with expenditures for maintenance and repair. 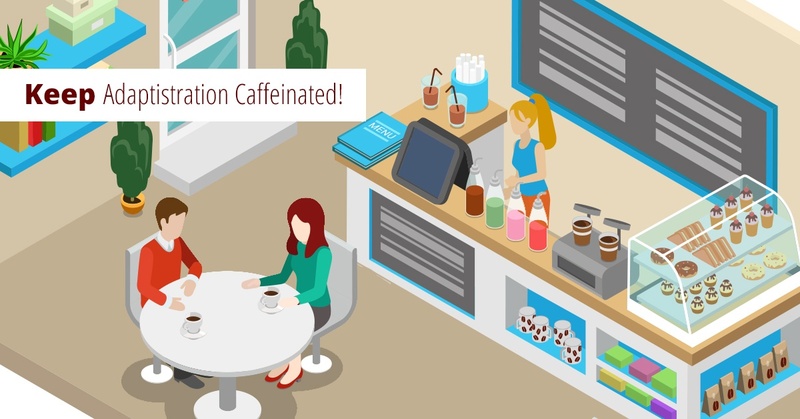 It helps them appreciate the costs they are expected to absorb over the course of their career. As a result, they can have a better sense of how much money they contribute to maintaining their skills and have less apprehension over asking for a fair wage. The following charts and graphs help illustrate not only how far these costs reach into musicians’ wallets but also provide necessary context to effectively manage the financial aspects of their career. In short, where you play, how you play and your attitude towards care and maintenance have a profound impact on your career costs of ownership. Author's preamble: this content isn’t necessary to enjoy the article but it does provide some additional insight as well as explain the original context of the research as it relates to the original article in 2011 edition of The Strad magazine. This research was originally compiled in 2011 for an article that appeared in the December, 2011 edition of The Strad. All costs are quoted in dollars but have been gathered in the UK, Germany and the US. The dollar values in this version have been adjusted for USD inflation to 2017 levels. I want to thank Ariane Todes, then editor of the magazine, for contacting me to ask if I had any article ideas for their upcoming “money” issue. Her subsequent support and assistance was instrumental in helping bring about an article with research that until then, had never been compiled. I hope everyone enjoys reading this material and it contributes in some small way to making the field a better place for all stakeholders. In the course of gathering data, I spoke to more than 70 orchestral musicians, luthiers and repair professionals from a diverse cross section of points in their respective careers, who are based in the US, UK, and Germany. During the course of gathering data, it became clear that everyone maintains very personal opinions on these subjects. As a result, it is important to remember that this report isn’t intended to produce a single figure or narrow range for the cost of ownership over the length of a career. Instead, the data is presented in a series of three spend-levels: low, medium and high. These are determined by a variety of factors such as location, type of instrument, cost differentials, and even a musician’s personal attitude. Variables like these have a dramatic effect on the total career spend, if we take a career as lasting 50 years. For example, a violist who changes their strings at the higher rate of frequency (twice a month) but purchases strings at the lowest price point will sustain approximately 53 per cent lower costs than a violist with similar frequency habits, but who purchases strings at the highest price point. 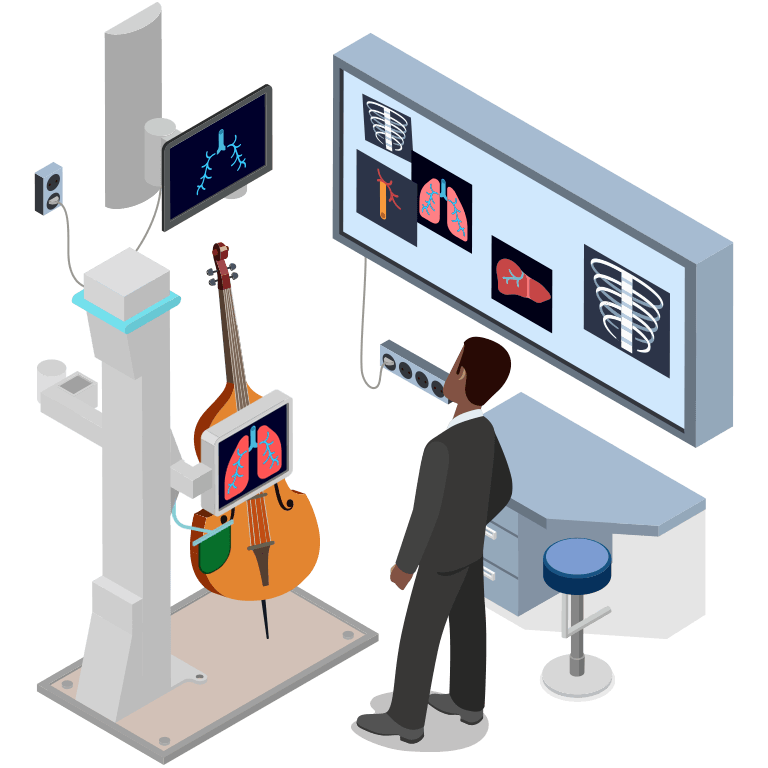 The total career spend for each instrument is relative to how much the owner is prepared to spend (spend-level) and how often (frequency). The difference in actual out of pocket expenditures between each instrument’s spend/frequency ratio can, to put it mildly, be extreme. 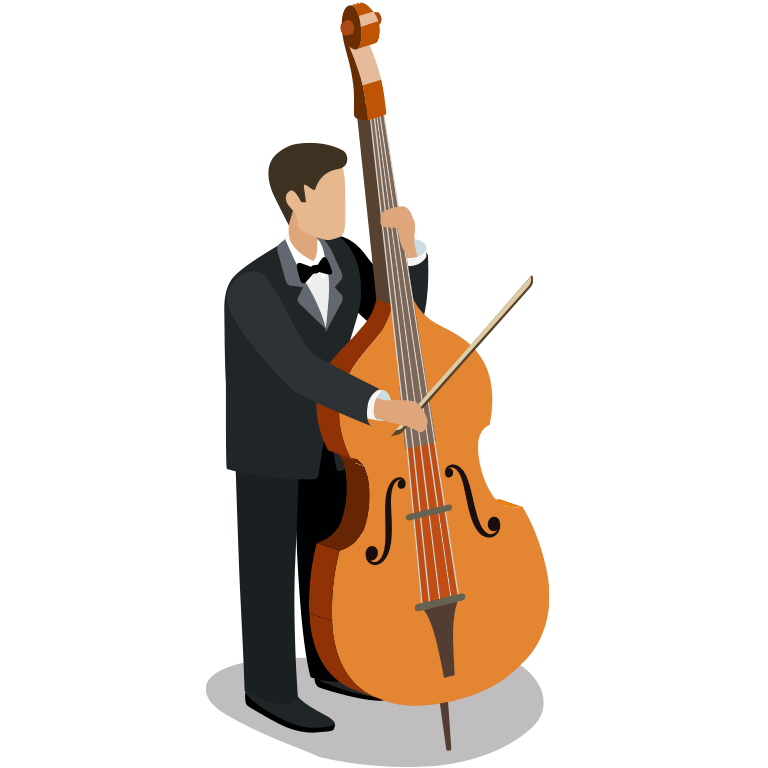 For example, high-spend bassists who maintain their instrument on a high-frequency basis will spend $256,930 over the course of their career. Compare that with a low-spend, low-frequency bassist who spends $45,700 and you can see just how much all of this matters. Curious to know how much the other instruments spend? 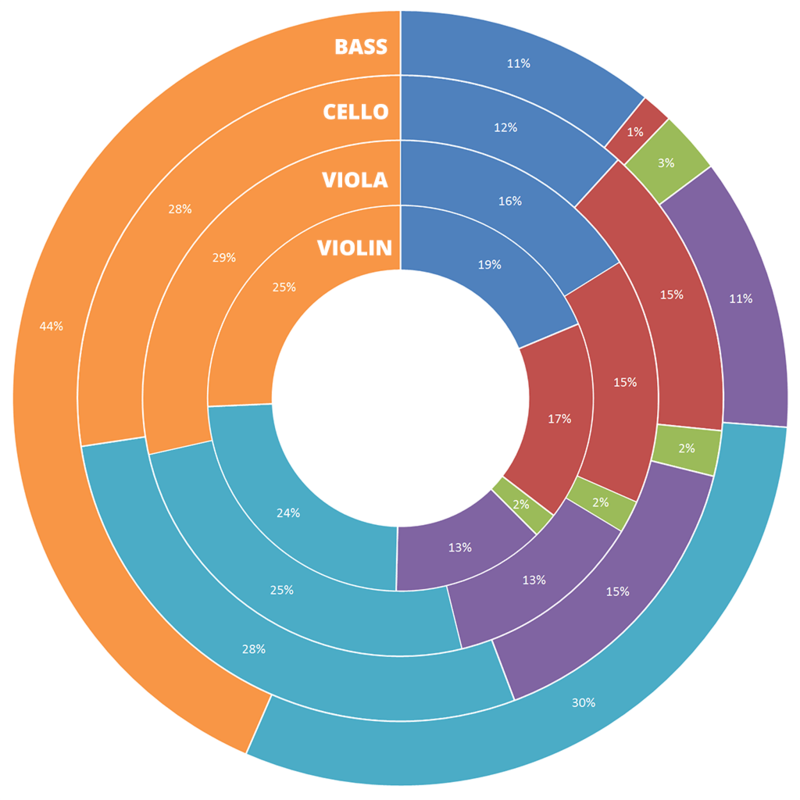 How your total career spend breaks down in each category, according to which instrument you play. 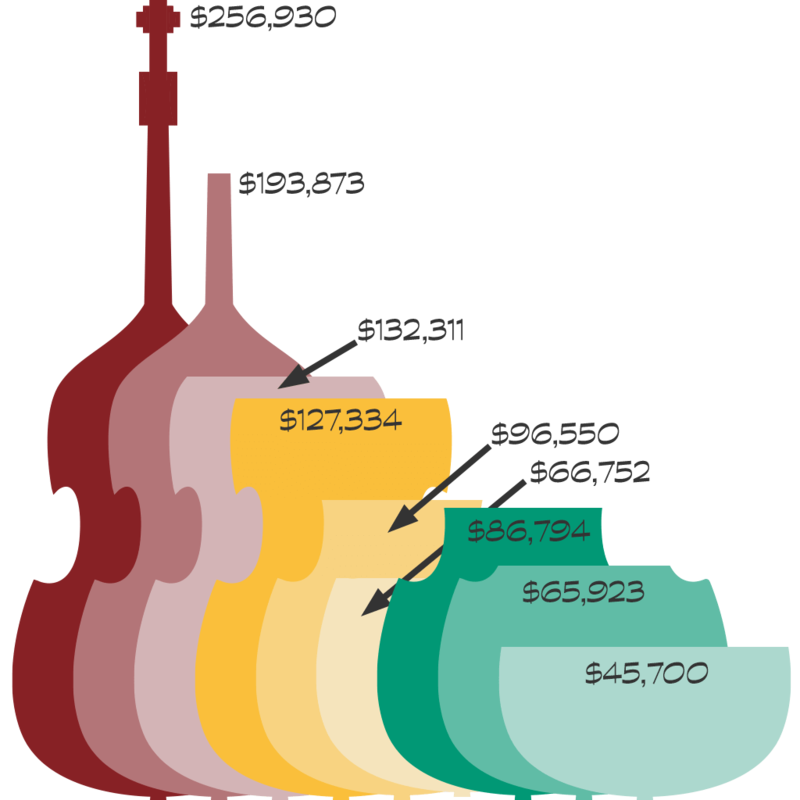 For example, a viola player will spend 16 percent of their career total on strings. Average career spend on annual maintenance and repair totals for each instrument as a proportion of the spend for all instruments. For example, at 33% and 30% cellists will spend more than their violin, viola, and bass peers on annual maintenance and repair. 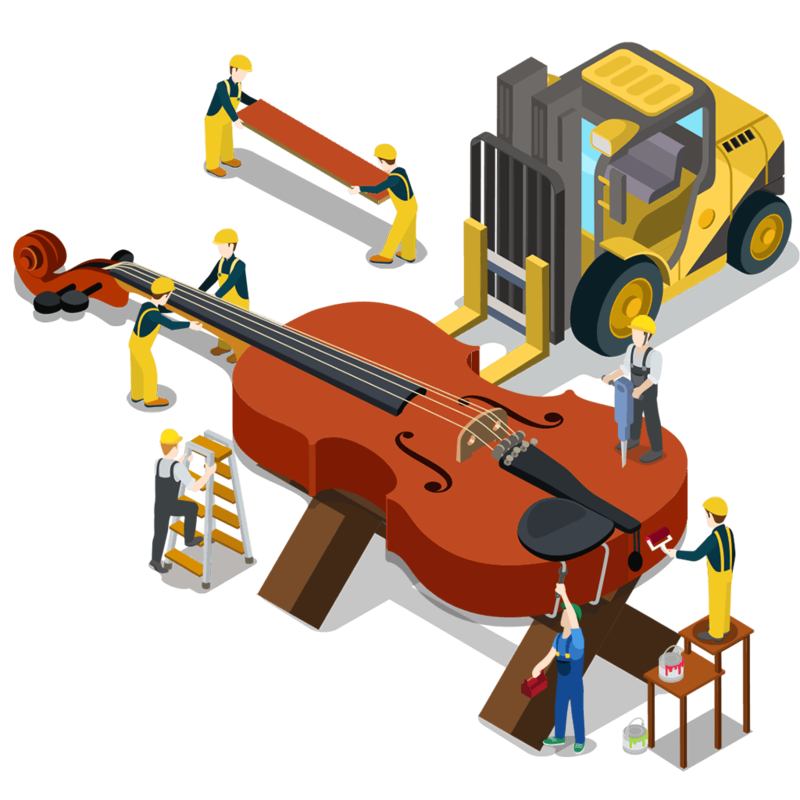 Here we break down some of the specific costs involved in caring for and repairing an instrument throughout the course of an orchestral career. Statistics begin with the annotated violin below and are followed by a selection of figures for the other instruments. The ranges are of low frequency–low spend to high frequency–high spend. 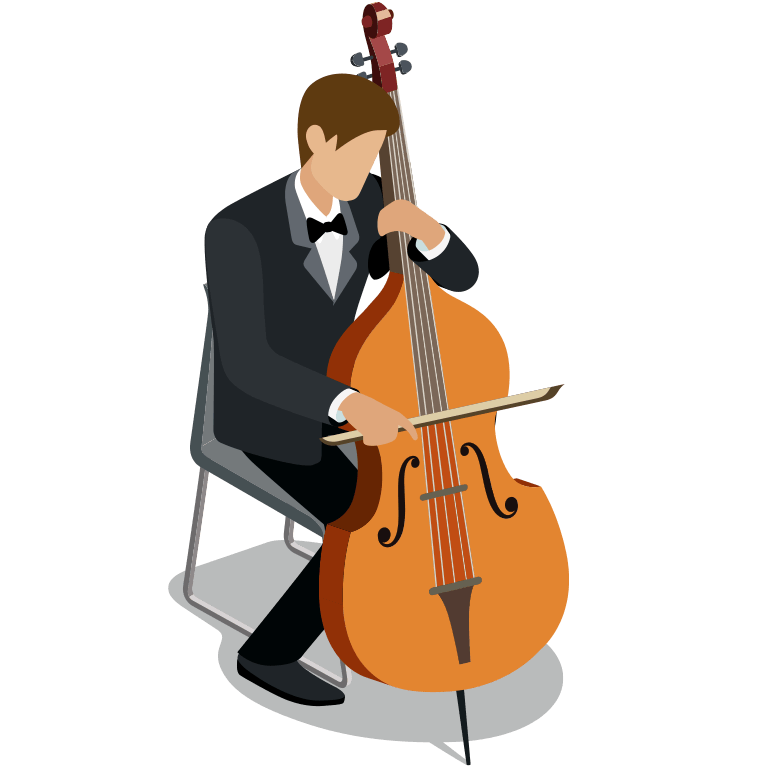 No examination of orchestra string instrument maintenance and repair expenses would be complete without a detailed look at strings, the single most frequent item to regularly wear out for most string musicians. So let’s take a closer look by at career spend rates ranging from averages alongside low spend – low frequency, medium speed – medium frequency, and high spend – high frequency extremes. It’s important to know what wasn’t included in the analysis that could still be considered an accessory, supply, maintenance or repair. Clearly, cases are associated with the actual instrument almost as much as the bow. But of all the accessories a string player can purchase, the decisions and needs associated with purchasing cases include enough variables as to make it counterproductive to include them in this review. 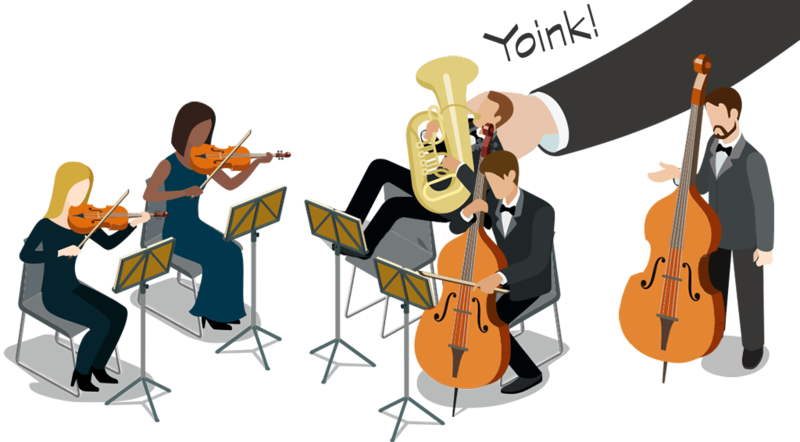 Differences in insurance costs based on the value of an instrument worthy of being used in a professional orchestra can be extraordinary. 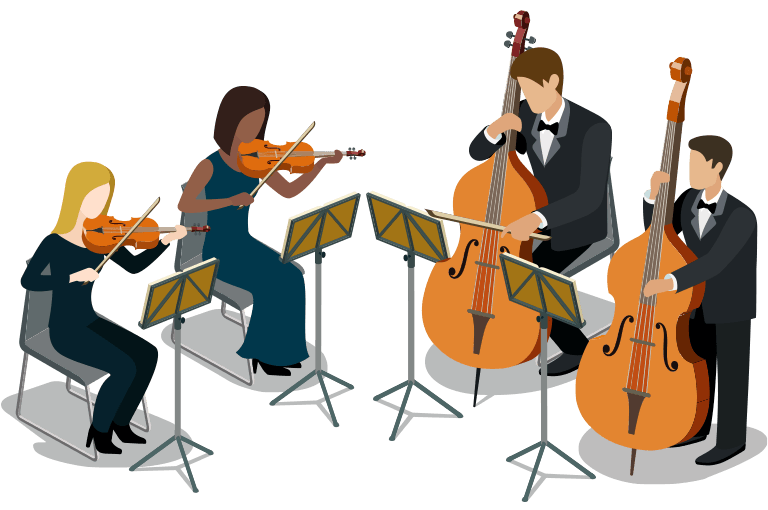 Moreover, there is a distinct difference between orchestras that may or may not provide instrument insurance as part of employment. The result is a very uneven application of costs that musicians may be expected to absorb. Neither of these elements is trivial and the reader should be aware that they are expenses that are above and beyond those catalogued in this analysis. Do these figures include music stands? Nope. Bow ties and other master agreement required stage wear? Nope. Expenses for non string musicians, like tubas? Are you kidding? Well, perhaps in another installment..but not this one. Nearly all of the luthiers and repair professionals agreed that musicians who bring their instruments in for regular maintenance and inspection end up having fewer instances of costly repairs. This attitude appears to be confirmed by the musicians as well. Those who say they follow their luthier’s recommended maintenance schedule reported lower instances of high-priced repair work. On the other hand, some musicians knew they were playing a riskier game, but their options were influenced by location, attitude, and budget. How many professional musicians remain in a single area for the bulk of their career? 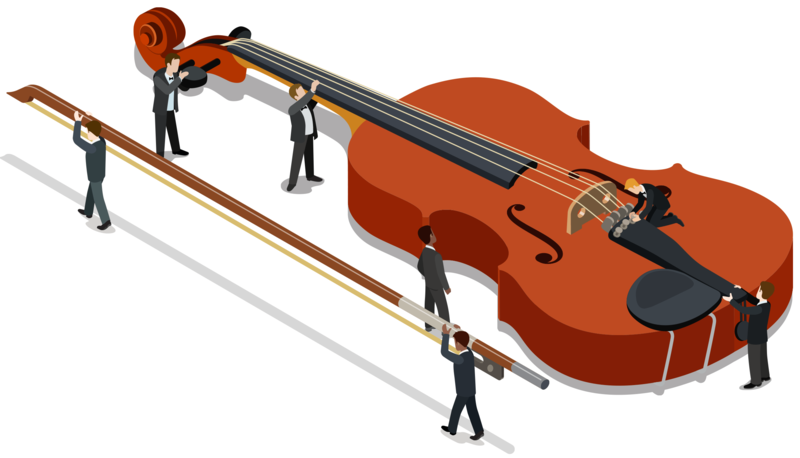 Tours, summer festivals, and working for ensembles scattered over the world conspire to ensure that professional string players are going to pay the cost of their own type of climate change. One of the by-products of this phenomenon is an increase in some of the more expensive repairs such as cracks and warping. Another repair professional with nearly the same amount of experience expanded on his colleague’s observation. The cost of these little pieces of plastic, metal and resin can certainly add up over time, as this chart shows. Losing your violin mute on a regular basis (one of the unfortunate habits musicians owned up to the most) could cost you up to $750 during a musician’s working life. … and found the information useful and enlightening. 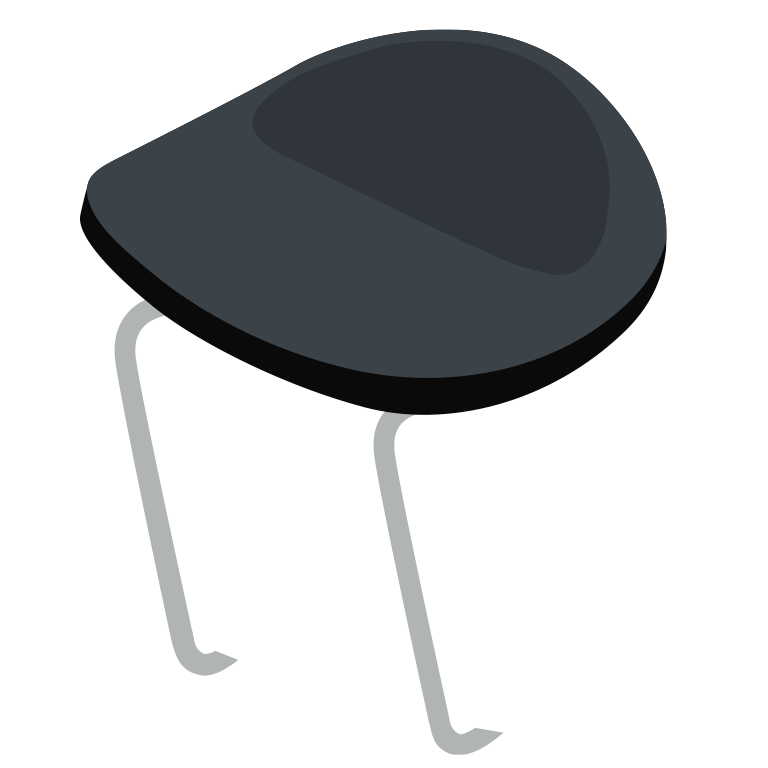 In lieu of traditional ads, Adaptistration has adopted a fully reader supported model so thank you for considering to contribute at an amount you find appropriate. “I hear that every time you show up to work with an orchestra, people get fired.” Those were the first words out of an executive’s mouth after her board chair introduced us. That executive is now a dear colleague and friend but the day that consulting contract began with her orchestra, she was convinced I was a hatchet-man brought in by the board to clean house.